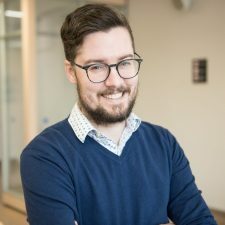 SSHRC-funded researcher Vincent Larivière of the Université de Montréal and participant at the Canada 3.0 conference in Toronto discusses his research on Big Data. Vincent Larivière: My research focuses on the effect of digital media on the way scientists produce and diffuse scientific information. From a production point of view, digital information created an increase in collaboration because it’s now easier to communicate with scientists throughout the world—to share information, to share papers. We see that the number of scientists per article—the number of authors per article—has increased tremendously, and also that quite a lot of these collaborations are international. In Canada, 50 per cent of all scientific papers are the result of international collaboration. From a scientific diffusion point of view, we see that digital information created a new competition for scientific journals, which was the main means of diffusing scientific research. So while it is still the main means of diffusion, we see an increase in e-prints of new discoveries that are mentioned or that are diffused through blogs or tweets. This has challenged the role of top scientific journals. Journals such as Science and Nature actually attract fewer top papers, so we see a diversification of the publication venues where top articles or top research is being published. It’s no longer only published in the top scientific journals. SSHRC’s panel at the Canada 3.0 conference in Toronto on May 14 brought together leaders in government, academia and the private sector to address key challenges and opportunities related to digital infrastructure, including data, technology and research tools. The goal of the discussion was to foster a better understanding of the need for preservation and accessibility of existing and evolving data, and for students to develop data analysis skills that will benefit all sectors. This discussion linked to the Digging into Data Challenge. Mis à jour le 1 février 2017 à 10 h 21 min.